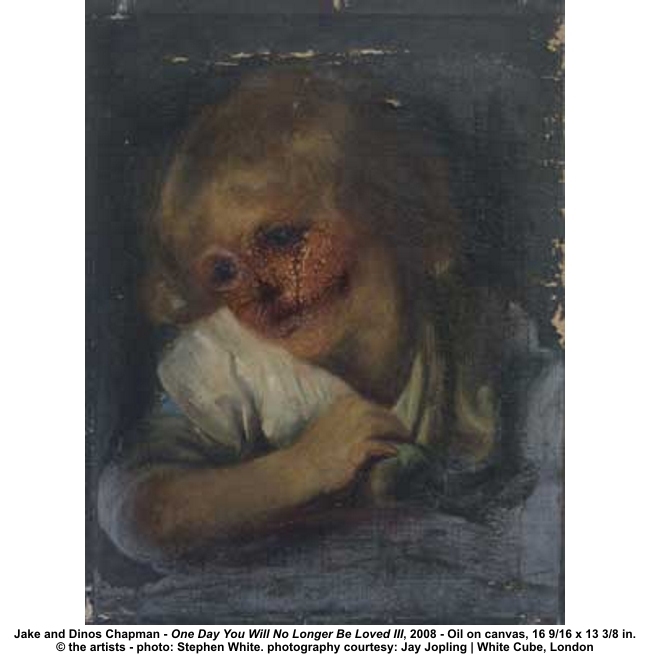 With Jake and Dinos Chapman, the Kestnergesellschaft brings two of the most important British artists working today to Hanover along with a group of works never before shown. Emerging under the label of Young British Artists in the 1990’s, the brothers’ art is scandalous and provocative. Behind the shocking appearance on the surface, however, there is an intense engagement with themes of humanity and moral behaviour, particularly humankind’s capacity for violence, barbarism and war. On exhibition 28 November through 1 March, 2009. Memento Moronika brings together the Chapmans’ most recent and diverse sculptural works. Composed of toilet paper rolls, cardboard and poster paint, the new sculptures Hell Sixty-Five Million Years BC (2004 – 2005) or Two Legs Bad, Four Legs Good (2007) seem, in their unique and rough materiality, harmless when contrasted with the painted bronze sculptures, Little Death Machines (2008). In contrast to the Chapmans’ otherwise ardent focus on technical perfection, these give an impression of dilettantish or infantile clumsiness. However, the individual works hold a pivotal thematic position in the context of the brothers’ overall oeuvre. The title, Hell Sixty-Five Million Years BC, refers to what is certainly the most ambitious and excessive work in the Chapmans’ oeuvre which was destroyed by fire in 2004: Hell (1999 – 2000), a tableau masterpiece consisting of more than thirty thousand tiny crafted figures which, mostly clothed in Nazi uniforms, carry out horrible acts of cruelty. Even though Hell Sixty-Five Million Years BC, with its primeval dinosaurs, presents an entirely different motif, it is plausible to understand this work as a continuation of Hell. The graphic series, Etchasketchathon (2005) and If you eat meat digest this II (2005) oscillate between the previous works’ themes and Chapman’s newest visual world. While the first impression of this new visuality is of children’s colouring books, by the last images, we arrive at tortured animals, whose faces are combined with images from earlier works. Relating to their own creative process, all the works on paper have to be considered as self-referential. The Victorian portraits in Memento Moronika, under the title of One day you’ll no longer be loved, are visual novelties on the one hand and notorious images of retouched Goya prints on the other. These portraits epitomise the Chapmans’ strategy: Repainting directly onto what has come before.